Ahoy me hearties! It’s no secret I heart Popical Island something serious. Almost as much as my pet parrot Wilhelmina. And what generous youngfellas and young ladies they are – putting on a free all-day event in Whelan’s in Dublin! Ooh-arh! 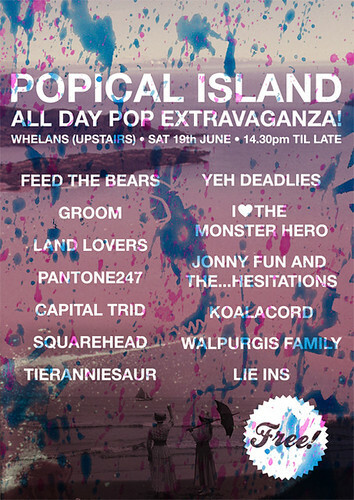 Popical Island collective are proud to present the much anticipated compilation album POPICAL ISLAND #1 on Saturday, June 19th, Upstairs@Whelan’s. In fact, we’re so proud, this launch gig will be FREE admission. And to maximize the pop-potential, we’re putting on a FULL DAY of indie shenanigans, starting at 3.00 PM. CDs will be on sale for €10 each: this is a limited, hand-made release, so get there early and get your copy before they sell out. It’s the perfect Summer record! Perfect summer record? Yes and yes and oh-yes! This is a gem of a compilation that you’ll treasure if you love pop hooks, sparkly melodies and surf-soaked jams. Oh, and handclaps. And boy-girl vocals (technical term). I don’t think this compilation could be more ‘now’, and I don’t mean that in a hipster way, just that people’s ears are very tuned into the summer-scuzzy-pop sound at the minute (Dum Dum Girls, Girls Names, The Beets, Best Coast, anyone?) and this Popical Island collection features Irish bands who are bringing this sound from their fair isle to our shores. There’s treasure on this island, me hearties! Wilhelmina and I will see you up the front!